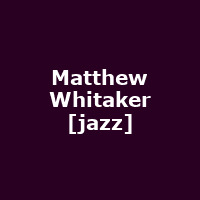 Matthew Whitaker is an extremely talented, blind American jazz pianist from New Jersey. He opened for Stevie Wonder aged just 10, and at age 12 was the subject of the short documentary, "Thrive", described as: "the prodigious talent and irrepressible spirit of a musically precocious 12-year-old blind boy". He released his debut album, "Outta the Box" in 2017, featuring Christian McBride, Dave Stryker, Will Calhoun, Sammy Figueroa, Melissa Walker and James Carter.